Following are the steps for the burning a DVD from any other DVD. 1. 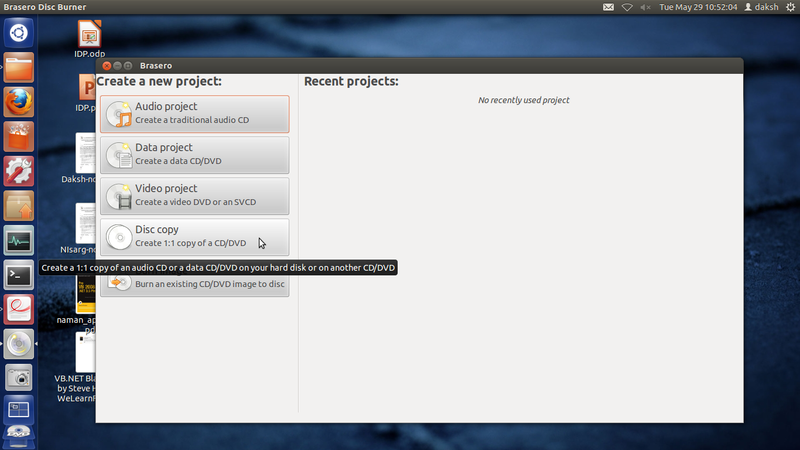 First insert DVD and open Brasero then click on Disc Copy button on left hand side panel in Brasero as shown in screenshot. 2. Then select you CD/DVD drive from 'select disc to copy' section and set properties like burning speed[4.0X for good result], for writing another time, for burnproof etc as shown in following screenshots. 3.Now you can show the progress how many data has been copied in temporary memory at how much speed on both the window and right-top corner [in notification area]. 4. After copy the data it will prompt for replacing with blank DVD. 5. Then checksum is generated and burning process starts. Checksum is needed to check whether the data written on DVD and temporary memory are same or not? So checksum is created two times during burning process. 6. At the end you get the massage "DVD successfully copied" at right-top corner notification area.